"This is a great book. It succeeds in the nearly impossible task of presenting empirical and theoretical depth in a way that is engaging and easy to read. I can recommend it to students, researchers and anyone who is interested in work or learning. It thoroughly deserves to be an academic best seller." - Irena Grugulis, Professor of Employment Studies, AIM/ESRC Services Fellow, Bradford University School of Management. "For most of us, most of the time, work plays a central part in our lives. 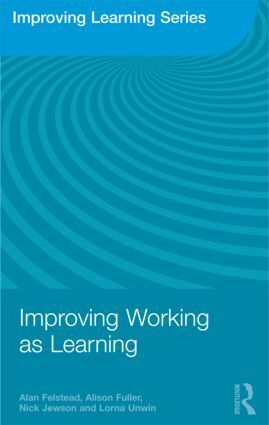 Improving Working as Learning, by four prominent and widely-published scholars, looks at the ways in which people learn as part of their everyday working life. Drawing on an impressive array of solid social science research, this is an original and wide-ranging book, with far-reaching conclusions that challenge conventional views of how work is to be organized and valued. It is a landmark study for anyone interested in workplace learning." - John Field, Professor of Lifelong Learning and Co-Director of the Centre for Research in Lifelong Learning, University of Stirling. "This book offers exciting new insights from the latest research on the workplace as a site of learning. It will be an invaluable resource for employers, policy-makers and practitioners." - David Finegold, Dean and Professor, School of Management and Labor Relations, Rutgers, The State University of New Jersey, USA. "This book provides a very welcome contribution to our understanding of how the organization of work can enhance or restrict learning. As employment in the UK becomes increasingly knowledge based, understanding the key drivers of workplace learning will be critical to developing effective skills policies in the future." - Ian Brinkley, Knowledge Economy Programme Director, The Work Foundation. Alan Felstead is Research Professor in the Cardiff School of Social Sciences, Cardiff University. Alison Fuller is Professor of Education and Work in the School of Education, University of Southampton. Nick Jewson is Honorary Research Fellow in the Cardiff School of Social Sciences, Cardiff University. Lorna Unwin is Professor of Vocational Education in the Institute of Education, University of London.